A while ago I've been playing with Vala. The cool thing about Vala is that it's a cutting edge language which is able to produce programs with similar performance to those written directly in C. Obviously, it may prove to be a perfect language for fast audio-processing tasks, and there already are bindings for JACK, liboil (now removed from PySoy), an ongoing effort to create bindings for libsndfile and probably other libraries, which I overlooked. Capsula is still in the earliest planning stages and doesn't have a roadmap yet. 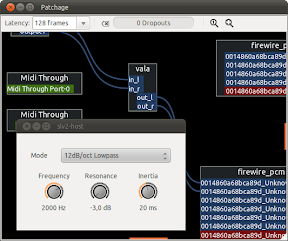 For now, I'm thinking about a full featured LV2 plugin host, completely controllable by OSC. I don't have any further ideas, but perhaps you have? Then, by all means, feel free to join the fun! 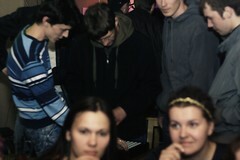 The release party in Gorno-Altaisk turned out to be the best release party we ever had, a really joyful evening. I have no idea how many people came, but the place was certainly full of people, who continued to arrive. We had the usual bulk of DVDs to give out, a talk about free software and Ubuntu, a talk about the local media environment, and lots of interaction and conversations about Ubuntu and open source. For the entertainment part, there was a Mafia game with a geek theme and some live music, performed under Linux with the monome (actually an arduinome) controller and rove. 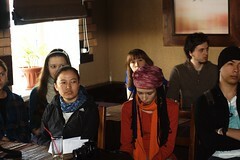 Several pictures from the event are below, and the full set is available here (courtesy of the Shum webzine). I'm always happy when more libraries get Python bindings, and today I've been especially excited by the fact that GObject introspection support for PolicyKit has finally appeared in Natty repositories. Basically it means, that PolicyKit is now accessible from Python through a native API without direct D-Bus communication. I've tried to port the querying example from PolicyKit manual and it did work! The Python example below is an almost line-by-line port of the original, but it should give you a basic idea on how to use the API for your own scripts. print("Authorization check has been cancelled "
"and the dialog should now be hidden.\n"
I suppose, the API is still a little rough on the edges, but it's already usable and I'm going to try it for an upcoming D-Bus service in indicator-cpufreq. Looks like it's perfect time to start moving things to GObject introspection already. Greetings to all the Planet readers! I've become an Ubuntu member today (or was it yesterday in Americas? 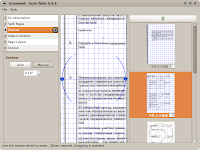 ), and this is my first post on Planet Ubuntu. My name's Artem Popov and I am an active member of the Russian Ubuntu Translators team. Sometimes, I also help with packaging / bugs and I intend to become a MOTU in the future. Ubuntu is my favourite distribution for a long time now, because I believe it has many things done right from the very start. Contributing to Ubuntu is a great opportunity to gain new experience and it's always a pleasure to work with such a rocking community. For now, I am going to continue my work on translations and packages with the MOTU team, but maybe I shall try some other ways of helping out. Fortunately, there are plenty of them! I have been using Natty since Alpha 1 and I'm very happy with the new Unity desktop. It has surely got its bugs, but I almost love it. The drawbacks are that Unity doesn't support GNOME applets and doesn't seem to have a native application launcher yet. The latter problem is easily fixed by installing either GNOME Do or Synapse. The applets, well... are not a big problem either, because I can't remember using any, except for the clock (replaced by an indicator) and the CPU frequency scaling applet, which had always saved me from all the JACK audio timing issues (with a single click). 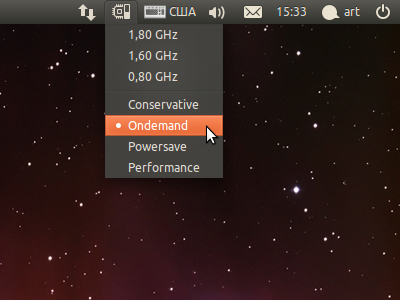 Thanks to Quickly, an Ubuntu package was a piece of cake. You can install it from here or grab the source from project page in Launchpad. Please report any issues. Thanks! Attach an Ubuntu button badge (I used a really old one). Have fun with the new Ubuntu ushanka! I didn't expect this to happen in the Karmic release cycle, and I'm very happy, that I actually managed to do it. Today is the day, when my first package has made its way into Ubuntu! Well, not exactly the first, since I have uploaded several sponsored bugfixes in the past, but this is my first real Ubuntu package made from scratch, that has passed all of the Ubuntu requirements. This would not be possible without people from #ubuntu-motu, who have been constantly helping out and correcting (sometimes really stupid) mistakes! Thank you, guys! It does one thing and does it well. It is suitable for processing both tiny and massive amounts of data. It does most of the work for you, yet still allows manual control over everything. It is free and open source. Last, but not least, it is very friendly and fun to use. And you can try out this amazing application by simply clicking an apturl link, if you have Karmic installed and there are builds for Jaunty in my Launchpad PPA as well. It's still got a picky FTBFS on armel, but I hope, that I shall be able to track it. This is where the things are starting to get really exciting!